It’s that time of year again. There’s only one week until football fans huddle around their television to enjoy the Big Game. If you’re hosting a gameday watch party for a group of family and friends, your home should have everything you need. Carefully designed with how you live in mind, you’ll find all the spaces you need to throw the ultimate game day gathering in a new Brock Built home. 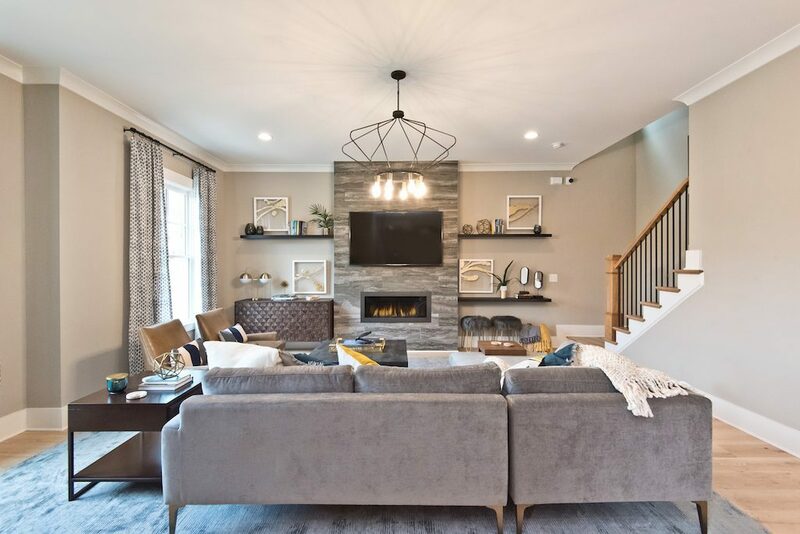 From preparing snacks to rooting for your favorite team, here are 4 perfect rooms for hosting a Big Game watch party in Brock Built homes. Everyone knows one of the best things about watching any football game is the delicious tailgate food. From grilled hamburgers and hotdogs to kabobs and tasty desserts, finger foods are a must for any watch party. 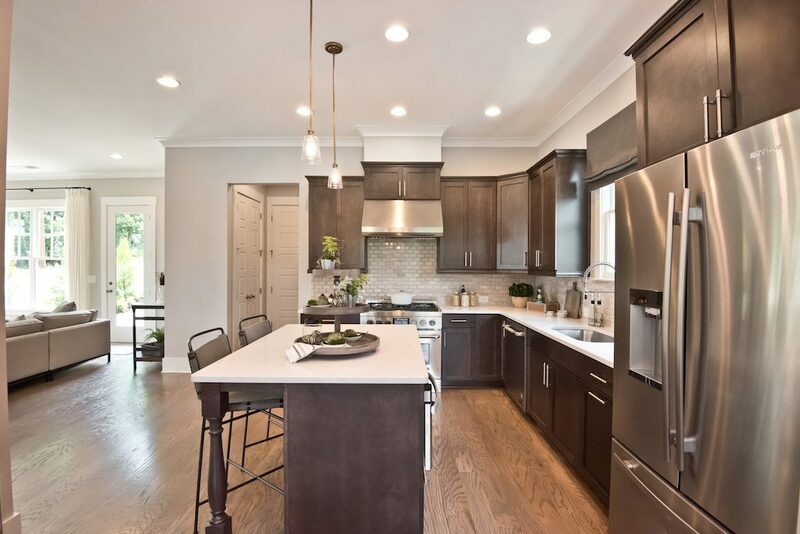 The open floor plans in West Town where the kitchen flows into the family room are the perfect place to prepare your tailgate spread. In these kitchens, you’ll find plenty of counter space to make all your favorite game day dishes before your guests arrive. Hosting Tip: If you’re hosting a large gathering, assign guests a category of a dish they should bring with them. For example, as the host, you can be in charge of the main dish. Then, assign guests to bring side dishes, desserts, and drinks. Down, set, potluck! Once all your game day snacks are ready, your dining area, like the one above in West Highlands, is the ideal place to serve the food. For large gatherings, move your dining chairs to the living room so there’s more seating to view the game. 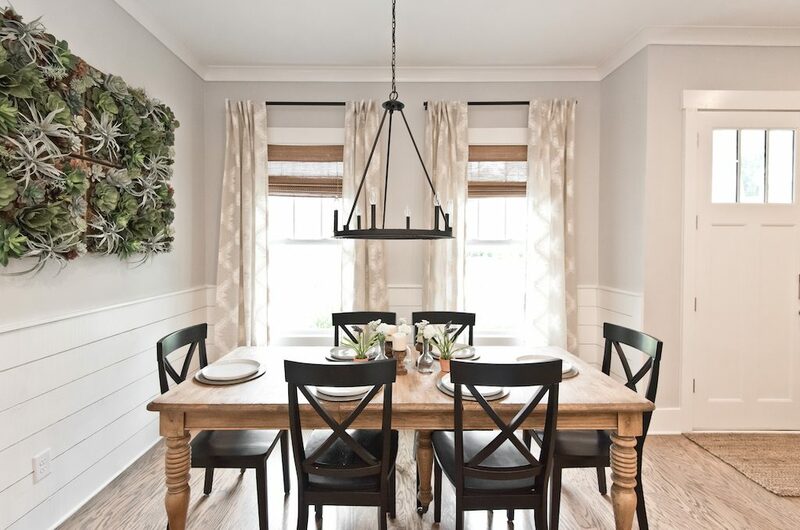 Several of our floor plans have open dining areas that overlook the kitchen and family room. So your guests can easily take a snack break without the fear of missing any of the action. Hosting Tip: Place a tablecloth over your dining table before placing all the food on it. This will protect it from accidents that are prone to occur (especially if you’re hosting a watch party for families with kids), and make it a little easier when you clean up after the party. When it comes to sitting down and watching the Big Game, it’s important to have a comfortable space. With spacious family room designs like the one above in Westside Station, you’ll have ample space to utilize your living room furniture and more. Add a few extra throw blankets and pillows, and you’re one step closer to creating the perfect atmosphere. Now you can sit back, relax, and enjoy the Big Game. Hosting Tip: Make sure you move any fragile belongings off your coffee table and side tables. This will protect them from excitement during the game. And, also gives your guests more room to place their beverages while they watch the action. For true football fanatics looking to take the game day experience to the next level, head to your media room. 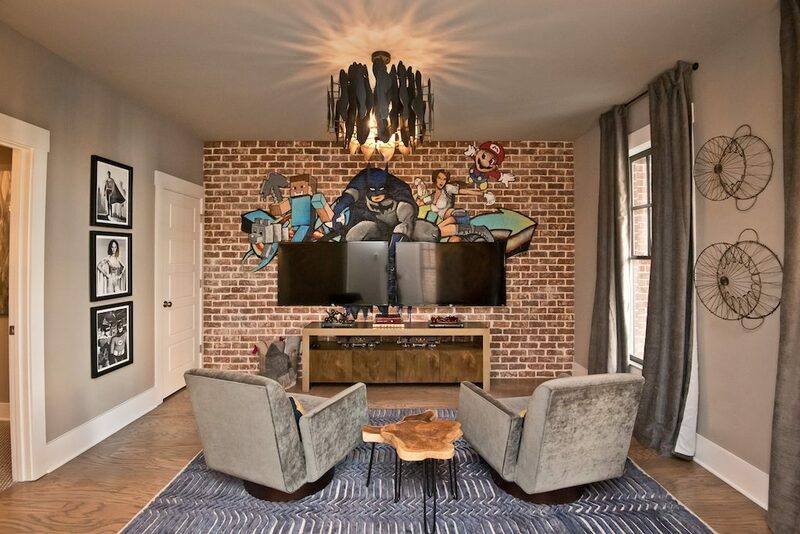 With a secluded, intimate setting like this media room in the townhomes in Westside Station, it’s the ideal place to experience the Big Game for fans who want less distractions. While the party’s going on, you and your friends can take in all the game day action in a setting of your own. Wherever you’re watching the Big Game, we hope you have a fun-filled time with family and friends. Inspired by these rooms? Come tour a Brock Built neighborhood near you to find the perfect home where you can host your next Big Game watch party.